Quickly design networks for optimal deployment and cost effectiveness with ease. 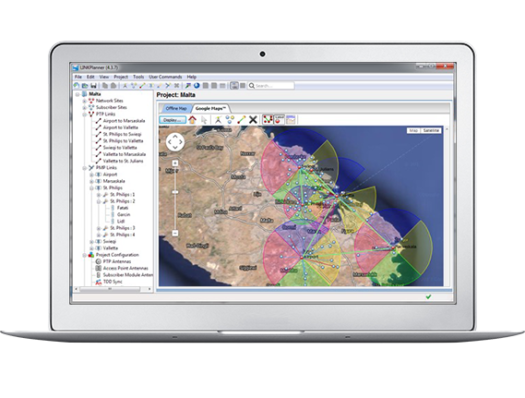 LINKPlanner allows you to model “what if” scenarios - based on geography, distance, antenna height, transmit power, and other factors - to optimize system performance before purchase. Quickly design networks for optimal deployment and cost effectiveness with ease. Available for Microsoft® Windows® and Mac® systems, LINKPlanner is a free, user-friendly link-design tool. LINKPlanner leads the industry as the most trusted and intuitive RF link planning tool, with tens of thousands of links deployed successfully worldwide. Path profiles are automatically imported into LINKPlanner when you create a new link using the Path Profile Web Service. Model links before deployment to optimize performance and throughput. For example, if a link calculation indicates low throughput, a number of factors (product type, frequency, channel bandwidth, antenna height and size, etc.) can be changed to test potential improvements in link performance. Learn LINKPlanner quickly with easy-to-use pull-down menus. Performance reports provide time-saving deployment guidelines, and single or multiple links can be planned simultaneously. LINKPlanner automatically generates bills of material and proposal and installation reports, simplifying the deployment process.